Late in this generation, it seems that developers are learning how to more effectively leverage the unique properties of the video game medium to elicit emotional responses from players. Things like text passages or spoken dialogue are effective in their own ways, but the interactivity is what can’t be matched by any other form of entertainment. This is evident in Brothers: A Tale of Two Sons. Not unlike last year’s stellar title Journey, here is a game that speaks no intelligible words, has no written text, and can be completed in one sitting – and it will leave you breathless when the credits roll. [singlepic id=16415 w=320 h=240 float=left]Brothers: A Tale of Two Sons tells the story of two boys who have already struggled with the loss of their mother, and are now faced with the reality of a sick and dying father. The village doctor expresses to them that they must travel to a special tree where they can retrieve what is needed to cure him. The journey takes the brothers through bright, beautiful landscapes meeting both friend and foe along the way in a Neverending Story-esque epic. Any words spoken in this title are not words at all. It’s gibberish not unlike what you would hear from The Sims, though decidedly less silly. It threw me at first, even prompting me to stop and ensure that I had the correct language chosen in the settings – only to find that there was no language setting at all. Still, you are never left wondering what a character intended to say. Through actions and situations, the message is always clear. It’s as if the developer dispensed with dialogue in much the same way a child removes training wheels from his bicycle. The true genius of this game is in the way that it uses game mechanics to connect the two brothers to each other, and the player to them. Both brothers are controlled simultaneously, one with the left stick and left trigger, the other with the right stick and right trigger – as the player, you are the common link. It feels a bit clumsy and takes some getting used to, and though it becomes easier with time, I never quite felt like I ever got the hang of it even as the game concluded. Fortunately, nothing about this title is particularly demanding from a platforming perspective. [singlepic id=16416 w=320 h=240 float=right]Regardless, as clumsy as it can be, this control scheme is ultimately paramount to feeling the bond that the brothers share. The older is stronger while the younger is smaller, giving each a unique approach to puzzle-solving situations. They also react in their own ways to characters met during their quest, more clearly establishing their personalities. Serving literally as the physical bond between the two brings you ever closer to them as you play. None of the aforementioned puzzle sequences really serve as brain teasers; it’s typically clear as to how to solve them, only a matter of going through the motions. Still, these situations are effective ways to develop the brothers’ relationship, and they rarely overstay their welcomes. Through the sub-three-hour play-through, I only grew slightly weary of a sequence which had the two siblings climb a wall while tied to each other, one serving as an anchor while the other swung to a handhold. It was a great sequence that seemed to stick around for just a tad too long. Beyond that slight hiccup, the game is paced beautifully from start to emotional finish. 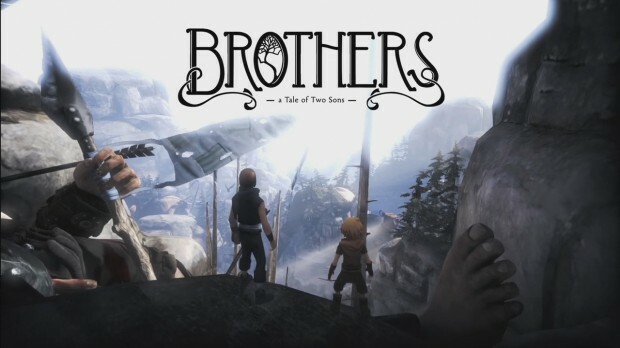 Brothers: A Tale of Two Sons is not about challenging platforming or confounding puzzles. It’s not about replay value or flashy visuals. This game’s brilliance is in how its moving story is told: all because of how you move your fingers – which buttons you’re pressing, and which ones you’re not. This is a breakthrough in what interactivity can accomplish with little aid from more traditional storytelling mechanics – its resulting importance to this medium is no exaggeration.